A true sign that spring has arrived are the bright yellow dandelions that began blooming in full force last week. 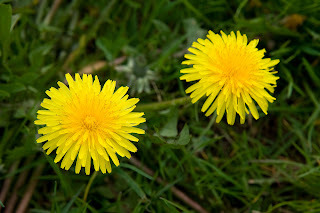 We can thank the colonist for bringing the dandelion to the New World. Its name is a French derivative which means ‘lion’s tooth‘, referring to the leaves which have saw-like ‘teeth’. The golden yellow head is a cluster of tiny flowers which appear as one. Its roots have hair like tendrils, each of which is capable of producing a plant and the seeds are fertile without pollination. The dandelion was purposefully imported to the Midwest to encourage survival of honeybees and it is the among the most widely recognized plants, growing worldwide. The Dandelion has many admirable attributes if one can get beyond the compulsion of having a perfect lawn. In fact the medicinal properties make it a natural garden darling. Early dandelion greens which appear before most other edibles are a plethora of nutritional benefits. Leaves may be added to salads and have a crisp flavor which resembles chicory or endive and have the ability to ‘cleanse the blood‘. They contain more beta carotene than carrots and are richer in iron and calcium than fresh spinach. They may be sautéed with other greens and onions as a side dish. Used in Europe, China and among Native American tribes, tea made from the leaves or roots acts as a gentle diuretic and system restorative. Stomach, liver and digestive problems have all been greatly alleviated by drinking dandelion tea, which does not tend to have the side affects of pharmaceutical medications. A tea taken now will cleanse the body of toxins which have built up over the housebound winter and allow an energetic ‘fresh start’ for spring activities. *My children grumbled but drank the tea each spring. The cheerful little flowers are sensitive to light so they open with the morning sun and close at dusk. The sweet delicate seed head is a wonder unto itself and has its own urban legend. 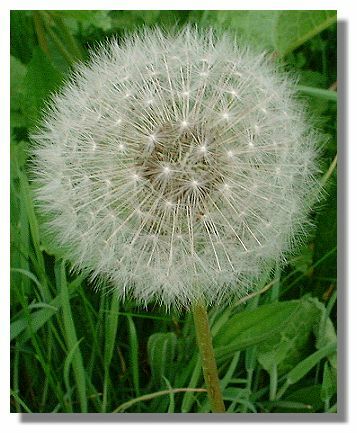 It is said if one makes a wish while blowing the magical seed head, dispersing all of them with one breath, the wish will be granted.